I love the quick and easy backgrounds you can created using the Depth of Field Technique. Here I paired the technique with the Stampin' Up! 's new Circle Circus Set. Morphing the technique a bit, I added a Black as a 4th color for a little more depth. 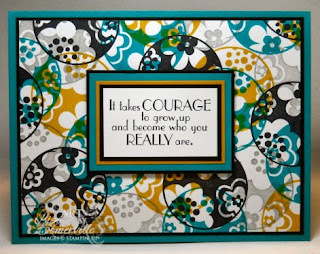 The other colors used are Stampin' Up! 's two new In Colors Bermuda Bay, Crushed Curry and Going Grey. The sentiment is from Hope Happens, which is one the the sets I picked for FREE for winning the May Wow contest - thanks Stampin' Up! This deal will be available via my website or you can email me to order. But hurry, the special promotional price will only be available through July 6, 9:50 AM (MT). Thanks for stopping by! All products used are available in the new 2009/2010 Idea Book & Catalog. Online ordering for the new catalog will be available via my website around 12PM (MT). Lisa, I LOVE your blog and your artwork - truly an inspiration! I have given you a blog award. All you have to do is post it on your blog with my name and blog link. Then you nominate 5 others and let them know! This is just so pretty, Lisa! Next time I do this technique I am so doing it one white...it just makes it look so bold an beautiful!! This set did not really peak my interest but you have me rethinking that, Lisa!! This is awesome!!! WOW!!! What an awesome way to use this set!!! Love the bold, gorgeous colours!!! this is a fantastic combo, and i love the technique. it's going to be CASE'd, but before i do that i'm givin' you credit on my blog for your inspiration.